We're proud to present the first of two pool tables bearing the Monaco name. With clean lines and solid edges, this table is equally suited to being a generously sized dining table, as it comes complete with a solid table top. Whatever your taste, this manufacturer never fails to impress. The classic styling of this table makes it subtle yet distinctive, and guaranteed to coordinate with existing furniture and decor. When you order, you can choose from a range of customisation options so your pool table really earns its place, and delights the whole family for years to come. Choose a reversible top, which gives you the added benefit of a ping-pong table. Or, you can choose a stylish glass top, or a top which matches the main pool table frame. With the top over the cloth, you can comfortably fit a large family around the table - perfect for any family dinner or occasion. The Monaco comes in 7ft, 8ft or 9ft lengths and can be supplied in a range of finishes and colours, from glossy or matt lacquered colours to a choice of five different woods. Like other Bilhares Europa tables, it also has a slate bed, so your shots will be straight and true every time. Your pool table is available with a 4mm laminated wood finish or in a lacquer spray colour with a glossy varnish or matt finish. The Monaco can be finished in any RAL colour - please see the available finishes in the chart below to select the perfect colour to match what you have in mind. Please contact Liberty Games to order if your desired colour is not in the drop down menu. Your pool table is fitted with renowned Hainsworth Elite-Pro cloth, the professional's choice for pool. Elite-Pro is a very fine thin cloth that is fade resistant and napless, which creates high speeds when played on. It has proven itself to be faster than any of the other styles of cloth, making it perfect for tournaments and league games. This worsted cloth is extremely durable and provides long lasting game play. It is important when choosing the size of your pool table to consider the room it will be situated in. It is recommended that there is enough room around the table to extend the cue from the edge of the table to the nearest wall. 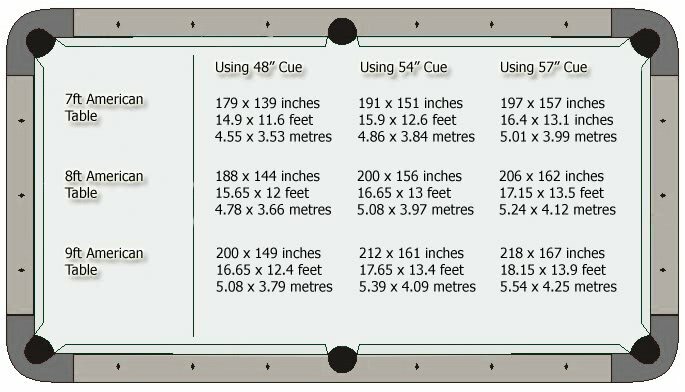 Below are the ideal recommended room sizes, however if space is a bit tight why not purchase a smaller cue to help with any tricky angles. If you have any further delivery requirements, please contact Liberty Games before placing your order. This product is delivered and installed by our dedicated courier service who will contact you by telephone to confirm the delivery day and a time (usually within a 2 hour slot). Slate Bed Pool Tables are built to order. This process can take between 4 weeks depending on the model (please refer to product listing for more information). Once the table is ready it will be collected by our courier and delivered to the customer within the following 5 to 10 working days. Please contact Liberty Games for shipping costs to areas north of Glasgow, Ireland and overseas before placing your order.